Guess what, it's Winter in Florida! Those few days a year where it's actually chilly. This means that the soup is on! I love soup and this time of year is great for harvesting a number of our local edibles. So I figured I'd share some of my favorite wild edible soups with you guys today. As usual, these recipes are vegetarian and vegan friendly as well as gluten free. If you want to add in some meat or dairy, be my guest and let me know what you think in the comments! Just be very careful when harvesting your wild edibles. A few good rules to remember is to harvest only 100 feet (or more) from roadways to avoid contamination from road run-off. Make sure to harvest only in areas that are not treated with herbicides and/or pesticides. Also be careful to not harvest from waste areas (many of these plants have a tendency to take in the harmful chemicals and minerals from these areas). Make sure that you thoroughly wash these plants before using them to avoid bacterial contamination, this is also important if you are harvesting plants that grow shorter than a dog's leg. I also follow the Native American harvesting tradition of only harvesting ¼ of the plants you encounter. You leave ¼ for the animals to eat, ¼ for the next wildcrafter/forager who comes along, and ¼ to grow and continue the population. And the most important rule of all, be 100% sure of what you are harvesting. If you are 99.99% sure, do not harvest. There are a great number of look-alikes that can be toxic, so please please be sure of your plant before consuming it. In a large pot, on medium-high heat, add in the olive oil. Give it a minute to warm up then add the onion, celery, and garlic. Cook until everything is just softened (about 10 minutes). Stir in the vegetable broth, water, and rice. Bring to a boil, reduce to a simmer, cover and allow the rice to cook as long as the package recommends (wild rice usually takes about 45 min or more), but don't drain it when done. Stir in the remaining ingredients, cover and allow to simmer for an additional 20 minutes. Check your seasoning, add more if needed. Serve warm! In a medium sauce pan, over medium heat, combine olive oil, onion, and garlic. Cook until the onion is transparent (about 5 minutes). Add in the flour and cook, stirring constantly, for about 1 more minute (the flour should not take on any color). Slowly drizzle in stock, whisking constantly to avoid clumps. Once all the stock is incorporated, bring mixture to a boil and reduce to a simmer. Cook for about 10 minutes, whisking occasionally. Meanwhile, in a large pot on high heat, bring a good amount of water to a boil. Sprinkle in a few tablespoons of salt. Prepare an ice water bath in a large mixing bowl (this will help keep the greens looking bright and vibrant). Blanch your wild greens by submerging them in the salted, boiling water for about 30 seconds. Remove from the boiling water and submerge them in the ice bath until ready to blend. Squeeze all the liquid out of your greens as you put them in the blender, a little bit at a time, with the sauce you've had simmering. I usually do this in about 2 batches. Blend the mixtures together. Once these are blended, add in a bit of the tofu, with a little salt and white pepper, and continue to blend until smooth. Once blended, pour through a sieve into a clean pot. Warm it up to just under boiling (if you boil it the color will get all muddy) and serve warm! In a large saucepan, on medium-high heat, combine first 5 ingredients. Sautee until they are nice and tender. Add in the vegetable broth and simmer for about 20 minutes. Puree the mixture using an immersion blender, or puree in batches with a food processor. Put back on the heat and add in the remaining ingredients. Cook for an additional 20 minutes. Serve warm! Prepare the head of cauliflower, cutting it into florets and dicing up the stalk. In a large pot, on medium-high heat, sautee the onion and garlic in olive oil until just transparent. Add in cauliflower and kudzu root. Cook, stirring constantly, for 2 minutes. Add in stock and water. Bring to a boil. Reduce heat to a simmer and cook, covered, for about 20 minutes. Puree mixture with an immersion blender, or blend in batches in a food processor. Stir in remaining ingredients and simmer for an additional 20 minutes. Serve warm! In a large stock pot, on medium-high heat, combine olive oil, onion, celery, and carrot. Cook until onion is just translucent. Add in the garlic and mushrooms and cook for about 5 more minutes. Pour in the vegetable broth, water, and lentils, and bring to a boil. Reduce to a simmer, cover and cook for about 1 hour. Add in remaining ingredients, cover and cook for an additional 20 minutes, or until the quinoa is fully cooked. Serve warm! Stinging Nettle Urtica dioica- This herb is notorious for it's sting. If you encounter it in it's raw form you'll know exactly why. However, once cooked or dried, nettles loose their sting and can be quite tasty, not to mention nutritious. Nutritionally, it's a great source of vitamins A, C, and D as well as iron, calcium, and magnesium. Medicinally, nettles are used to treat hay fever and similar allergies throughout the world. Because of the sting, this is one green you definitely want to blanch or dry before using in recipes. Spanish Needle Bidens Alba- Spanish Needle is one of the most under-appreciated plants in North America. It's also one of the most prolific. Everywhere you look, especially here in Central Florida, you can find it. The young leaves and flowers are edible, but the whole plant is used medicinally. For most recipes, you really want to blanch the leaves first, but this step is not necessary when using them in a soup. Nutritionally, bidens leaves are very similar to spinach and packed with lots of vitamins and minerals. Medicinally, they are very useful for upper respiratory conditions. Purslane Portulaca oleracea- One of the most nutritionally jam packed green on earth, Purslane contains more omega 3 fatty acids than any other plant known. It's also full of vitamins A, B, C, and E, beta carotene, magnesium, calcium, folate, lithium, iron, and protein. You can use the leaves and stems for any of the above recipes. It's also a powerhouse of medicinal benefits. Red Clover Trifolium pratense- As a member of the legume (bean) family, Red Clover leaves have a slight bean flavor. The flowers are even more tasty and are supposedly the most tasty of any of the clover flowers. Nutritionally, red clover is full of nutrients including vitamins A, B, and C, zinc, calcium, magnesium, manganese, and potassium. Medicinally, red clover is one of the best herbs for women as it helps to balance the female hormones. It's also a great aid in helping to prevent cancers of all types. Peppergrass Lepidium virginicum- Peppergrass is very prolific here in Central Florida, and quite peppery in taste, almost like a very mild horseradish. The seeds can be used to flavor foods like pepper, the root can be used similarly to horseradish, but the leaves are delicious raw. Nutritionally, the leaves are a good source of vitamins A and C. Medicinally, this plant is great for the kidneys and has been used, traditionally, to treat asthma. This is one of the few plants that actually have no known dangerous look-alikes. Chickweed Stellaria media- Usually one of the earliest spring greens that show up in the eastern portion of the United States, Chickweed is a great choice for a pot herb. Nutritionally, it's full of calcium, magnesium, potassium, and quite a few other nutrients. Medicinally, this is one of the most amazing little herbs for your lymphatic system. You can use the leaves, flowers, and stems in these recipes. Drymary Drymaria cordata- This Chickweed look-alike does not taste like it's cousin. Chickweed has a mild corn flavor. Drymary's leaves and young shoots are edible and can be quite tasty if prepared as a pot herb. There is some question about toxicity in large quantities, so parboil it and discard the water before you use it in these recipes, just to be on the safe side. Dollarweed Hydrocotyle bonariensis- Also known as Pennywort, Dollarweed tastes like carrot tops, or a bit like celery. It's a common weed in Florida that drives most lawn-owners crazy. Not only does it like lawns, but it also really loves to get it's feet wet, which means that you'll find it at the edges of rivers, streams, and lakes. You can also find it marshy areas. You can eat it raw, but you can also pickle/ferment it to make a “kraut” similar to sauerkraut. Dollarweed is often confused for Gotu Kola, which is a close cousin and has similar medicinal and nutritional benefits. Nutritionally, dollarweed is a decent source of minerals as well as B vitamins. Medicinally they are great for lowering blood pressure. Use only the leaves for these recipes. Gotu Kola Centella asiatica- Gotu Kola is quite a bit more bitter than it's cousin Dollarweed. But it's also packed full of more benefits as a result. A few Asian cultures believe that if you eat one of these leaves a day, you will live forever. While they may not contain the secret of immortality, they are amazingly beneficial for almost every age-related issue. You can consume the leaves raw or cooked, though I do recommend using them sparingly because of the bitterness. Pine Pinus spp.- The needles and nuts from pine trees can be a great addition to quite a few recipes. While the needles have a distinct flavor and may not lend themselves to a lot of recipes, pine nuts are amazingly mild and can be quite pleasantly added to just about everything. Also, pine needles tend to be sharp and wiry, so if you're going to use them in these recipes, you might want to cook them and then discard the needles before you serve the food. Pine needles are loaded down with vitamin C and many other helpful vitamins and minerals. I like to include them in soups during cold and flu season, or when I start feeling a bit under the weather. Kudzu Pueraria lobata- Introduced in the 1800's to provide additional foraging for livestock as well as to for erosion control, Kudzu has taken over in many areas of the US. However it's a great plant to eat and it has a number of medicinal benefits. Kudzu leaves, flowers, blossoms, vine tips and roots are edible. This plant produces fragrant blossoms which you can make into jelly, syrup and candy. You can cook the root, which contains starch and can be used as a coating in deep fried foods, or for thickening soups and sauces. Flowers can be tossed on a salad, cooked or pickled. Stems and young leaves can be consumed raw or cooked. This pesky vine is a staple food in both Japan and China. It's packed full of antioxidants, helps calm down an upset stomach, and may even help treat alcoholism. Throw a couple blossoms or leaves in any soup recipe above, or add in some of the root like you would potatoes. Wild Grape Vitis riparia- Wild Grape, Fox Grape (Vitis labrusca), and a number of other grapes found out in the wild, are both edible and medicinal. The leaves are what I commonly eat, and they taste grape-like, unlike the toxic look-a-likes that can be found in some areas. You can eat the grapes themselves, but many of our native vines don't produce them on a regular basis and they tend to be quite small. You can eat the fruit and leaves raw as well as cooked. One of my favorite preparations is the Middle Eastern or Greek Dolmas (or stuffed grape leaves), but I have also been known to scoop up some hummus in the raw leaves from time to time. Medicinally speaking, grape leaves are amazingly astringent and anti-inflammatory. They help prevent and treat diarrhea, heavy menstrual bleeding, uterine hemorrhage, hepatitis, stomach aches, rheumatism, and edema. Nasturtium Tropaeolum spp.- This herb may not be native to Florida, and may not be found in the wild, but my mother got me addicted to growing these tasty treats as a young girl. She used the excuse that for every flower I picked, two more would bloom, but I think it had more to do with the fact that we both loved to eat them in our salads. The whole plant is edible, and nasturtium flowers are one of the most recognizable, edible flowers on the market in America. The whole plant tastes peppery and you can use the flowers and leaves fairly interchangeably, but you can also pickle the seeds to add a little pop to your salads. There is only one warning associated with eating this plant, and it's a common one. Nasturtiums contain oxalic acid which can cause health issues when consumed in abundance. For that to happen, you'd need to eat several pounds of the leaves in one sitting, but the warning is there none-the-less. Nutritionally, nasturtium leaves and flowers are packed full of vitamin C and iron. Medicinally, nasturtium leaves are antibiotic, and this property is strongest just before the plant blooms. I use both the flowers and leaves for these recipes. Watercress Nasturtium officinale- Watercress is a green that has been eaten by humans for our entire history, and one of the oldest to be cultivated. You can still find it in quite a few grocery stores today. Nutritionally, it is loaded with vitamins A and C, and contains significant amounts of iron, calcium, and folic acid. Medicinally it is loaded down with benefits as well. The vikings considered it THE food to eat in the spring because it helped to flush the body of all the built up chemicals that come from existing solely on meat throughout the harsh winters. Just avoid eating too much of this tasty green during pregnancy. Florida Betony Stachys floridana- Locally, this is often seen as a horrible weed, only to be eradicated in most lawns and gardens. However, I love them. This is one of the herbs that I harvest most for both medicinal uses and food. Now, most people think the leaves taste a bit much like medicine, but a few of them in the pot can add quite a few medicinal benefits. However, the tastiest part is the root, well really the tuber. They look like fat white worms or grubs. But they're crunchy and taste like a mild radish. I love to pickle them, cook them with a little olive oil, or even eat them raw. They make a great addition to any of the above recipes, just clean them, chop them, and add them in like you would a potato. Wood Sorrel Oxalis spp.- This is a plant that can be found everywhere in the world, except at the North and South poles. There are around 850 different species and they are all edible. Oxalis leaves taste a little sour, reminiscent of a very, very mild rhubarb. You can eat every part of this plant, but I do need to caution you about over-eating it. Oxalis contains oxalic acid which can cause health issues when consumed in abundance. For that to happen, you'd need to eat several pounds of the leaves in one sitting, but the warning is there none-the-less. Nutritionally, oxalis is high in vitamin C, iron, and zinc. Medicinally it's great for reducing fever, increasing appetite, and it happens to be a diuretic. For these recipes, I use the leaves, but the tubers are eaten all throughout Eastern Europe and South America. 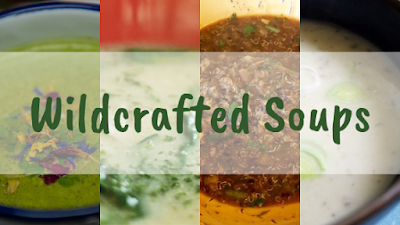 I hope you enjoy making (and eating) these soups! If you have any questions or comments, please leave them below! For more information on weeds and herbs that you can eat, check out these awesome websites!